Since I made a big batch of “bucket bread” dough the other day I’ve been experimenting with it in various forms. The first was a loaf of bead baked according to the directions. It was delicious! The crust rose up with a beautiful “grigne”, and the crumb was creamy and cool with some large irregular holes–just perfect. I just had some toasted with my eggs and it was scrumptious. Next, in response to one of Jennifer’s questions, I made pizza. It worked out fine, but my partner preferred my regular white-flour version. It was certainly a more robust flavour, and it was also chewy, which some may like but my partner did not. Personally I liked it, and it was very convenient since I had the dough in the fridge anyway. I would guess that adding some oil to the dough would soften it, but I’m not sure if you can do that after the initial mixing stage. If I try it, I will let you know, and vice-versa, okay? As for her question about flour, I may write a separate post about this, but I have stopped using my kitchenaid mill for now. Just like Jennifer, I never found I was able to make a good loaf with my fresh-milled flour. It tasted fabulous, but I could not get it to rise. I found I could use about half fresh flour, half commercial flour, plus an ounce of high gluten flour and get a delicious loaf, but that was using my bread machine. I have no idea how it would work in this recipe. If anyone else tries, please share your results! Okay, stay tuned for a post on starter care! 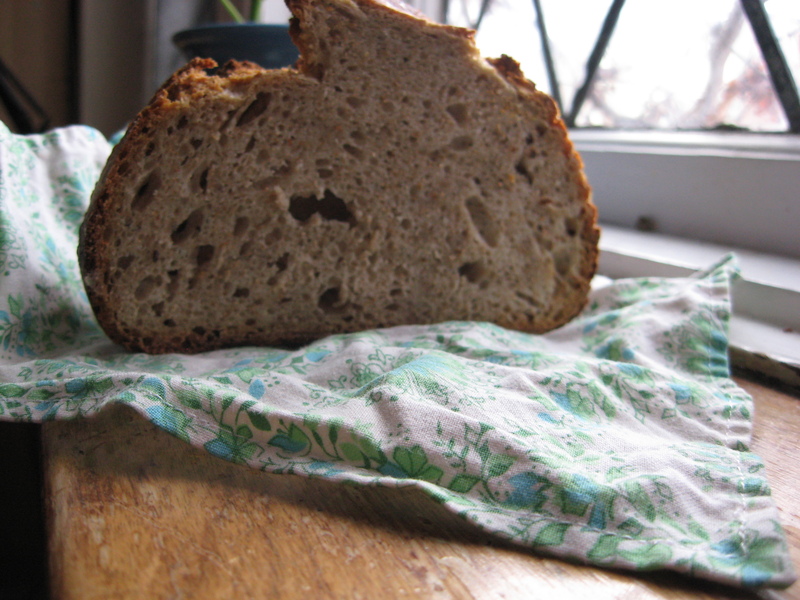 I blogged a long time ago about wanting to find a sourdough version of the New York Times no-knead bread, using whole wheat. Well, I never did manage to figure it out all by myself, but the GNOWFGLINS sourdough e-course has a version that I’ve been playing with. Add your starter to a large container (your “bucket”) that can hold all of the dough in a risen state (2-3 times bigger than the initial dough). Add salt and water and stir until all is dissolved. Measure your flour in a separate bowl and have your preschooler add it to your bucket handful by handful as you stir. Incorporate all the flour–you will have to use your hands near the end, but it will be a wet dough, necessary for the no-knead/refrigerator method. Once the dough is formed, keep it out on the counter for a few hours until the dough has started to rise, then transfer to the refrigerator. Keep the dough for minimum 12 hours and maximum 5 days before baking, to give it time to develop more flavour. As the dough sits in the fridge, the yeast, bacteria, and enzymes are all at work unravelling the starch molecules, releasing more flavour compounds, resulting in better tasting bread! When it comes time to baking, preheat the oven to 450 degrees and place a covered enameled cast iron dish inside. Cut off a hunk of dough and form into a boule, rounding the top so that it creates a taut skin over the surface. Here is a beautiful video demonstrating this technique, from my favourite baking master, Peter Reinhart. In the video he is working with a wet dough, similar to our dough. Let the dough warm up and rise for about 30 to 60 minutes (I’m still playing with this timing–see what works for you). When you are confident that the boule has risen enough and that your oven is hot enough, take out the cast iron container and plunk in the boule, seam side up (essentially upside-down). Cover the container. This creates a moist environment to allow for a good “oven spring”. Alternatively, you can use a steam pan in your oven, or mist the sides of the oven with a spray bottle. Bake for about 30 minutes covered. Then remove the cover and bake until the bread is finished baking. You may have to turn down the oven if the bread seems to be browning too much. Check for doneness by thumping the bottom–if it sounds hollow, you’re probably done. The bread should register 200 to 210 degrees on an instant read thermometer. This timing will depend on the size of your loaf, your flour, and the actual temperature your oven bakes at. After that, let the bread cool, and enjoy! Let me know if you try it out. Like I said, I’m just starting to play with this recipe, but I do like the simplicity of it. The same method but with a dryer dough can be used to make crackers or other baked wonders. I should also mention that when you make your next batch, you can use the same bucket, without washing it. Just hold back 1 1/2 cups of old dough and use that as your “starter”. You will probably want to keep back some of your old starter in its pure salt-free state, and keep it fed and fresh for other uses. Also, if you want some starter, just let me know and I can either dry & send some to you, or share it fresh if you are in Ottawa. I always want to share the sourdough love! I believe it was Suzanne who left a comment on my “Heatwave” post about using a crock pot in the summer to avoid heating up the house. That got me thinking. I’ve been doing a lot of reading over on A Year of Slow Cooking, and have been feeling very inspired about my crock pot. Apparently they’re very efficient little cookers, letting off very little heat, which also means very little wasted energy. And then, I think it was the Roasted Garlic Spoonbread recipe that got me thinking . 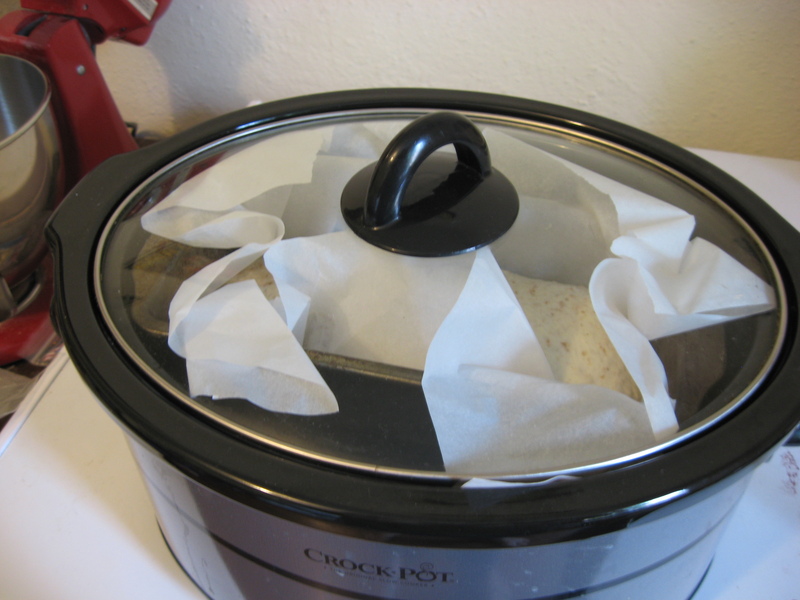 . . is it possible to bake bread in a slow cooker? Is that crazy? Or is it a wonderful, wonderful way to make bread all summer long without heating up the house? In the end, I think it is somewhere in the middle, or possible both: a little crazy and a little wonderful (though I’m willing to go a little crazy to try to amp up the wonderful, in classic Frugal + Urban experiment stylez). So what I did is this: I made a batch of miraculous no-knead bread and stuck it in the fridge over night. 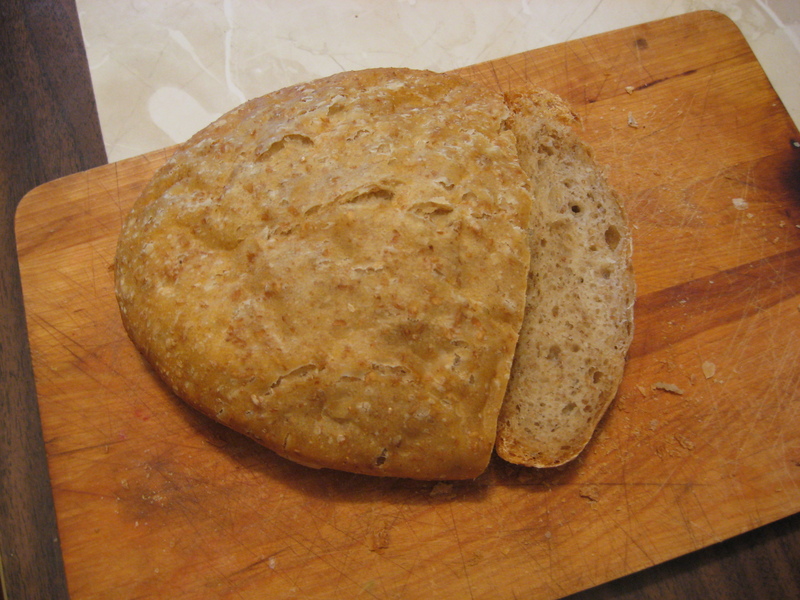 Then this morning, I hacked off a hunk of dough, shaped it and stuck it into a parchment-lined small loaf pan. I let it warm up to room temperature and then I stuck it into the slow cooker on high, which I had warmed up for 15 minutes beforehand. After about an hour, the delicious aroma of baking bread started filling the house. I let it bake for about 3 hours total, until I could see the sides were browned, and it had a nice hollow thump sound when I knocked on the bottom. I removed it and let it cool out of the pan. In the end, it tasted very good! A little misshapen, but that was because of my sloppy parchment papering. The weirdest thing was the crust: it was crunchy and browned on the bottom and sides, where it had come into contact with the heat of the pan, but soft and pale on top where no heating element had the chance to crisp it up, and where it may have been exposed to a lot of moisture falling from the lid. But none of that stopped us from eating the whole loaf. 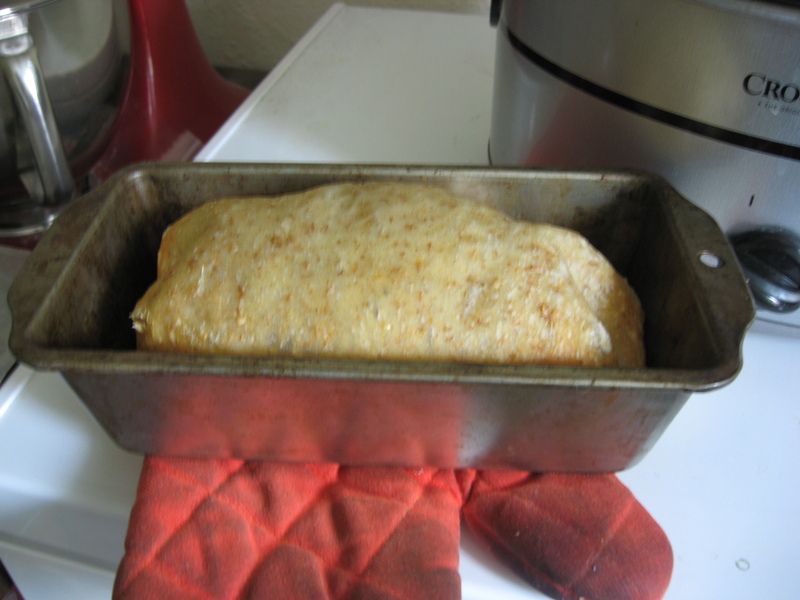 June 23 update: Another yummy loaf of bread! This one, baked right inside the slow cooker insert, without a baking pan, was only crisp on the bottom, and, maybe because I let it cook longer, the top was not as soft. I did vent the lid with a toothpick before going to bed (just used the toothpick to hold the lid open a tiny crack, enough for some steam to escape), which may have been a factor in the improved top crust. I didn’t leave it overnight, but woke up around 4 or so and went and shut it off. In any case, it worked out well because the loaf is halfway eaten already! All this bread baking is a clear inspiration to go and pick some local strawberries and make a big batch of jam! I’ve lost my sourdough starter. By which I mean, it got so polluted and gross that it wasn’t working at all any more. So I’m starting my starter over. Again. I actually gave it a try not long ago, and found my starter infected with leuconostoc, which imitates a true starter by getting bubbly and smelling sour, but it is actually bacteria, not yeast, which is bubbling. It gets very sour right off the bat, and doesn’t have that yummy beery/yeasty smell that makes bread taste like bread. Peter Reinhart says to make the starter with pineapple juice, so that is what I am going to do. I’ll start it tonight and will report back soon. Once my starter is established, I’m going to follow the methods described in Peter Reinhart’s Artisan Breads Every Day, which incorporates the no-knead approach with sourdough techniques, exactly what I set out to investigate last summer. Fortunately, Peter Reinhart, with his big team of testers, has taken the challenge instead! I’ll let you know what happens . . . Most of you who have checked out my bread recipes would notice one thing right away: they’re pretty heavy on the white flour. Most of my recipes are, in fact. 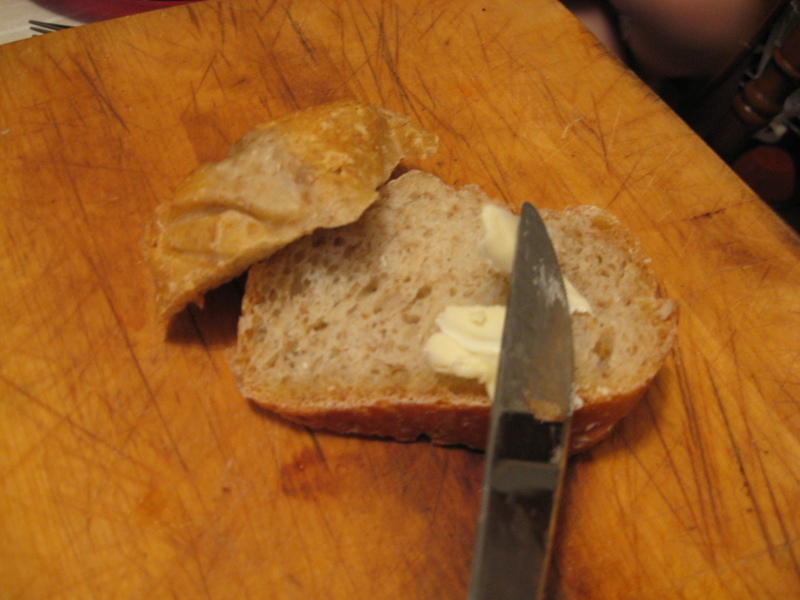 And we eat a lot of bread, which means white flour constitutes a pretty large portion of our diets. Lately I’ve been thinking that’s not such a good thing. The thing is, I really like simple bread recipes, ones that contain only 4 ingredients: flour, water, salt and yeast. Unfortunately this formula only really works with white flour (at least as far as I know). Since my supreme enlightenment (discovering Artisan Bread in 5 Minutes a Day), I’m completely sold on the no-knead method and the simple recipe, and don’t want to complicate it any more with shortening or sweeteners. I want my easy bread and the fibre/nutrient content too! So I’ve begun another experiment: slowly increasing the amount of whole wheat flour I add to the mix. I’m trying to find how far I can go, what percentage whole wheat flour I can get to where the simple recipe and techniques still work. 1 cup of whole wheat flour (5 1/2 oz) was barely noticeable. The crumb was glossy, and speckled with occasional flecks of bran, and the taste was fairly indistinguishable from the all-white version. A completely innocuous way to add a bit of fibre and nutrition to the recipe. 2 cups of whole wheat flour (11 oz, or around 30% of flour by weight) actually added to the flavour, I thought, making it slightly more complex. The texture was still great and the loaf was beautiful. 30% whole wheat is what you will see in most “light whole wheat” recipes. 3 cups of whole wheat flour (16 oz, or 50% of flour by weight) is just in the oven now . . .
Well, after baking and cooling and slicing and buttering and finally tasting, I have to say this is pretty darn good! Still a lovely lofty loaf, with a crackling crust and beautiful full flavour. I thought at 50% I would start to see some density happening, and start to taste some bitterness, but none of that has happened! So I’ll keep pushing it–next time to 4 cups out of 6! If anyone out there has experience using whole wheat in the Artisan Bread in 5 recipes, please let me know! I’ve been enjoying the bread recipe from Artisan Bread in Five Minutes a Day so much lately–it’s all we’ve been eating for the last few weeks. I’ve been baking the full batch (two 2-pound loaves) each time and freezing one loaf, but there have been a couple of occasions when we got through both loaves in about 2 days. We eat a lot of bread! But since this revolution (REVOLUTION, I say!) of the no-knead, high-hydration, easy-peasy bread, I have been missing two things: the first is my sourdough. While the Artisan Bread does have a complexity that quick-rise breads lack, it still isn’t quite sourdough calibre. Second is whole grains. We’ve been eating a LOT of white flour. Delicious, sure; but it’s definitely less nutrient-dense and fibre-rich than whole grains. So, I decided to finally give my latest experiment a try: merging the Artisan-Bread-in-Five-Minutes-A-Day techniques with my sourdough knowledge, to try to come up with a slightly easier way to make sourdough. I’m also hoping for a lighter, more holey loaf. I took a look on the interweeb, and found a lot of sourdough recipes using the no-knead techniques discussed in the Mark Bittman New York Times article that made the no-knead bread famous. I find the Artisan Bread in Five techniques even easier and lower fuss, but didn’t turn up any results on a sourdough version. So I gave it a try. And the results were . . . well, they were okay. Quite sour, which might be due to the long rising time, or possibly because of the state my starter is in (I keep leaving it for weeks, and then just refreshing it a few times before baking; it will probably change with more use). It also burnt a bit at the temperature I baked it at, while the inside is a bit undercooked, so next time I’m going to try 400 for a short time–maybe 20 minutes–and then 325 for maybe 40 minutes. Also, it is more holey than my previous sourdoughs have been, probably due to the higher hydration and longer rise, but it didn’t get much oven spring, which I attribute to the “germ-added-back-in” organic bread flour. I just don’t find it has much gluten structure, no matter what I do to it. Next time I’ll try an all-white sourdough to rule out the possibility that the structure is simply breaking down from the longer rise. After that I’ll maybe try an organic all-purpose whole wheat, just to see. In any case, here’s my recipe, which I did by weight because that was the only way I could keep the hydration (percentage of water) consistent with the original recipe. Basically I substituted 6 oz of my 100% hydrated starter (that means a 1:1 ratio by weight of flour to water) for 3 oz of water and 3 oz of flour in the recipe. I dissolved the starter in the water, and mixed the salt with the two flours, then stirred the dry ingredients into the wet until combined. I let this sit out overnight for about 14 hours, after which I divided it, shaped it, and put the 2 loaves into their loaf pans. After a rising time of 4 hours, I baked the loaves in a preheated 450 degree oven for about 45 minutes, after which time they were almost burnt on the outside so I took them out. See this recipe for more detailed instructions. And if you have any other resources that might help me with this project, please recommend!! !